This is the GenRight built Triton JK. It is a 2013 Jeep Wrangler JK Rubicon, we built this Jeep as a good all around wheeler and daily driver. We built and drove this Jeep all over the country to participate in Jeep Jamboree USA trial runs. Originally built with our Aluminum armor wrap, including our "Boulder" stinger front bumper (FBB-8145) and chrome Raceline wheels. Then we introduced our low profile "Winch Guard" front bumper (FBB-8345) and swapped it out. In 2014 we installed our full roll cage (GRC-8001), LED lights, swapped out the wheels for Raceline beadlock wheels and Rugged Ridge half doors. Here you can see our rear bumper (RBB-8220), rear tire carrier (RTC-3810) and Spyder Lighting LED tail lights. The Jeep worked good out on the trail and our high clearance fenders (TFF-8720 & TFR-8020) allow the 37" tire plenty of room for articulation. 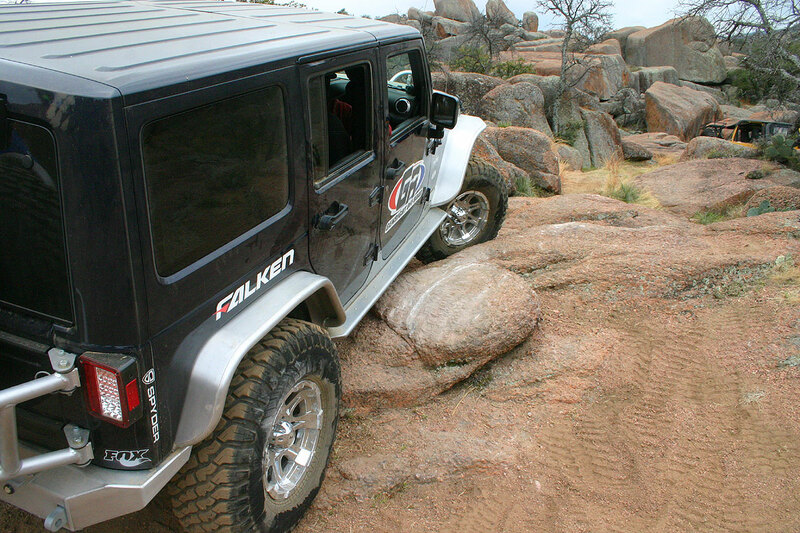 The 37" Falken Wildpeak M/T tires work great! We also relocate the license plate to the center of the tire carrier. Here you can see how our high clearance rocker guards (RCG-8004) help to clear trail obstacles on this long wheelbase Jeep.